NextAirlock - Senior 2 piece. Our oxygenation air stone now comes with MFL fitting option for easy cleaning. This innovative design was the result of customer feedback about the difficulty of santizing our traditional barbed stone when tubing was attached. 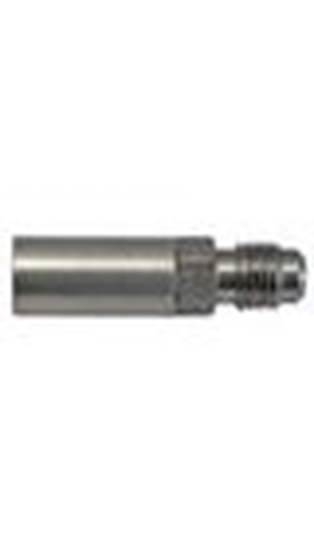 We added threads instead of a barb and now you can use our JG quick release fittings or swivel nut & barb kit to connect and disconnect your tubing. This allows you to place the stone by itself directly in a pot of boiling water to sanitise. Easy. To properly sanitise your stones, you can boil in water for 3-5 minutes. By heating the stone to boiling temperatures you kill all possible contaminants that may be hidden within the micro-pores of the stone. Boiling also greatly reduces clogging issues by helping to remove sugar residue. If boiling is not an option, we recommend soaking in Star San, which will remove the majority of surface contamination/bacteria, but will not sanitise the interior of the stone which may or may not be contaminated. You do not want to touch the stainless stone portion with your hands. The oils on your fingers can actually clog the small pores in the stone. The stone does not come with the barb fitting or flare nut - those will have to be purchased on their own. The 2 Micron size is more commonly used for aeration or oxygenation pre fermentation, but can be used to carbonate beer. Warning: Boiling or soaking this stone is likely to result in blocked pores, due to their extremely fine size, which can be difficult to clear without prolonged drying. We recommend running air/CO2 through the stone whilst submerged in your favourite non- rinse sanitiser.